1. First make the pico de gallo: in a bowl, mix the watermelon, tomatoes, salad onions, coriander, jalapeño and lime juice. Chill for 20 minutes. 2. Pat the sea bass dry on both sides with kitchen paper then season. Warm the oil in a frying pan over a high heat. Cook the fish, skin-side down for 2 minutes, turn over and repeat until golden. 3. Meanwhile, cook the rice according to pack instructions. 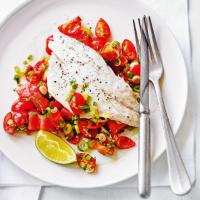 Serve the fish with the chilled pico de gallo, a lime wedge to squeeze over and the rice on the side.